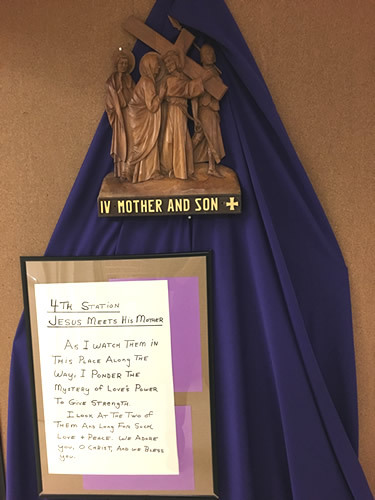 During the Season of Lent, Mount Michael provides an opportunity for the students and staff to make the way of the cross. Over the past few years, this has been done in the gym. Mount Michael has a set of stations that come from Italy. They are hand carved and really artistic pieces. One year, 2014, the students were literally the stations and each student held the station as all made the journey with Jesus. This year, in addition to using the same set of stations, they were projected on a scene to make them even larger. And station by station have been positioned in the bottom hallway, near the dining room, to remind all of journey Jesus made for us.